The text’s statements on computer games are doubtful. It states that “an increasing number of studies show that playing violent games, like watching violent TV, increases hostility and aggression.” However, more than half of studies looking at the connection between media violence and violent activity failed to find any significant link (Pinker 311). The spread of video games has mirrored the fall in the violent crime rate. Nor it is clear that the greater appeal of software applications to boys than girl is a problem. Newborn boys show a greater affection for mechanical contraptions than newborn girls in their first day (Alford and Hibbing 2004), so how are similar observations later on surprising? Likewise, the the Columbine shooters played â€œDoomâ€ lessens when one learns the last game they played was bowling (Moore 2002). Following the text’s advice on the Internet can impede development. The author focuses on negative aspects of electronic communication, such as increased loneliness and exploitation. Then what to make of these quotes: “I’m from a medium-sized city, I’ve still found it hard to find good company…” (Chirol 2006) and “The Internet makes this far easier in today’s world.” (Curzon 2006)? They are statements of domain experts on how Internet communication has allowed them to experience the advantages of geographical nearness (tdaxp 2006) that is required for expertise in a talent domain (Csikszentmihalyi 1996, Gardner 1997). A focus on negative aspects of new technology is harmful, especially when combined with an incomplete literature review or pessimism. The Internet is good for you, and video games don’t hurt. At least, that’s what scientific research tells us. tdaxp. (2006). The Creativity Anarchy. Paper for Creativity, Talent, and Expertise. Alford, J. and Hibbing, J. (2004). The Origin of Politics: An Evolutionary Theory of Political Behavior. Perspective on Politics, Vol. 2 No. 4, 707-723. Curzon, G. (2006). Personal communication. Chirol, I. (2006). Personal Communication. Moore, M. (2002). Bowling for Columbine. MGM Distribution Co. The criticisms thrown against biological factors in human behavior from the outside are rational — from the perspective of ideology, prestige, and power. Substantive criticisms of biological factors have come from the researchers themselves, who criticizer earlier work in the field and make better explanatory models than what previously existed. 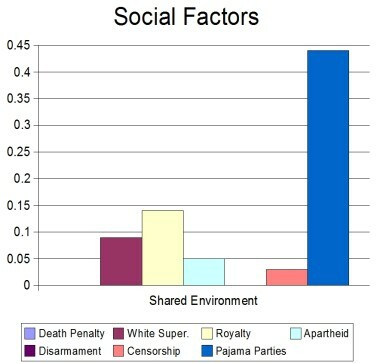 The Standard Social Science Model is based on a “utopian vision” (Pinker 27), and this ideology led researchers to greet genetically-related findings â€œwith fear and loathing because they were thought to threaten progressive ideals” (103) or to support racism, sexism and… “biological determinism” (Tooby and Cosmides 35). Such findings were considered closer to fascism (Ridley 3,186) instead of the more fashionable Marxism (Pinker 127, 410, Ridley 243-244). “Immoral” thoughts (269) that threaten the utopia are attacked as such, even though it is the job of researchers to think about even disquieting things (279). This bias in favor of the world as they want it has lead to embarrassing hoaxes (Ridley 204, Tooby and Cosmides 44), blinded them to short (Pinker 311) and long (307) term declines in violence, and other incorrect assessments of the field (Alford and Hibbing 718). Prestige is an important element as well. The existence of the social sciences as they exist now is traceable to an ancient division of labor between the social and natural worlds (Tooby and Cosmides 20) and the subsequent belief that cultural effects have cultural, not physical, causes (Ridley 205, Tooby and Cosmides 22). A unification, whether of practical questions like homicide and war (Pinker 323) or entire fields such as psychology and anthropology (Tooby and Cosmides 121) leads to questions of why psychologists as we know them and their methods should even exist (21). Likewise, for the same reason that much of art criticism is merely “the upper classes denouncing the tastes of the lower classes” (Pinker 277), intellectuals have denounced those who focus on genetic factors to keep their own place secure. A realization that one’s political theories or methods of research may be genetically influenced (Alford and Hibbing 716-717) places a social scientist’s behavior into a world of limitations and frailties (Pinker 239). The most disturbing line of attack against new knowledge is the desire for power. Pinker beings his book by writing “The belief that human tastes are reversible cultural preferences has led social planners to write off people’s enjoyment…” (Pinker x), which is perhaps why Leftism is not only a mover against genetic factors (133) but also in favor of earlier disasters like eugenics (153). More recently, social scientists have pushed an authoritarian agenda centered on “renewing” once vibrant neighborhoods (170) or making families eat in large dining halls (246). It is perhaps not surprising that totalitarianism requires the super-plasticity of environmental determinism (Ridley 185). The possibility that the scientific enterprise to understand society is under malevolent attack from certain political forces should not be doubted â€“ especially when attack from other political elements is widely recognized (Pinker 129). These attacks are doubly unfortunate because many claims are debatable. 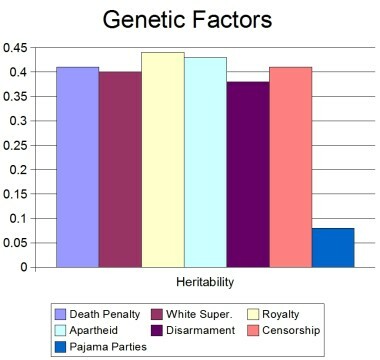 Tooby and Cosmides say that children are born with the same potential (25,33), but if traits associated with violence (Pinker 315), intelligence (Ridley 25), and even political beliefs (Alford and Hibbing 714-715) are largely heritable then some infants come equipped with more potential in a given society than others. Likewise, the seminal claim that humans have an enforced uniformity (Tooby and Cosmides 38) is questioned by computer models showing stable dimorphism (Alford and Hibbing 718). Even more so, the utility of a theory built around a universally-designed (Tooby and Cosmides 35) “incredibly intricate, contingent set of functional programs” (24) may decline to zero if the majority of the program is regulatory and not structural (Alford and Hibbing 717). Such a finding would call into question the factual validity of the mind as an information-processing machine with “invariant relationships between informational inputs and “behavioral” outputs” (Tooby and Cosmides 66). Even central questions of whether investigation into selection’s pressures should focus on genes (67) or not (Alford and Hibbing 708,712) has been left to biological researches themselves (also Tooby and Cosmides 36), and rarely their so-called critics. â€œThe Psychological Foundations of Culture,â€ by John Tooby and Leda Cosmides, in The Adapted Mind, Oxford University Press. [notes]. “The Origin of Politics: An Evolutionary Theory of Political Behavior,” by John Alford and John Hibbing, Perspectives on Politics, Vol 2. No. 4, December 2004, 707-723 [notes]. â€œAre Political Orientations Genetically Transmitted?â€ by John Alford, Carolyn Funk, and John R. Hibbing, American Political Science Association, May 2005, http://www.apsanet.org/imgtest/GeneticsAPSR0505.pdf [notes]. A theory’s potential on the roles of nature and nurture affects how it explains individual differences. Some theorists emphasize stability — that children who are high or low in a characteristic (such as verbal ability, anxiety, or sociability) will remain so at later ages. These theorists typically stress the importance of heredity. If they regard environment as important they usually point to early experiences as establishing a lifelong pattern of behavior. Powerful negative events in the first few years, they argue, cannot be fully overcome by later, more positive ones. Other theorists are more optimistic. They believe that change is possible and likely if new experiences support it. While I generally admire the author’s balanced view of the nature-nurture controversy, I believe this paragraph is confused. Prominent nature-oriented perspectives have emphasized early learning and stability. Sigmud Freud, for example, believed that psyhosexual development in early childhood can have lasting impact (Berk 17), while even Jean Piaget emphasized that an early childhood passage through the sensorimotor stage was necessary for success concrete and formal operations (21). Under either Freud or Piaget, a child’s maladaptiosn early in life will cascade into problems later on. At the same time, proponents of genetic influences attack the idea that traits must be stable throughout life. “Just as teeth or breasts are absent at birth, and yet appear through maturation,” the founders of Evolutionary Psychology write, “evolved psychological mechanisms… could develop at any point in the life cycle.” (Tooby and Cosmides 10). 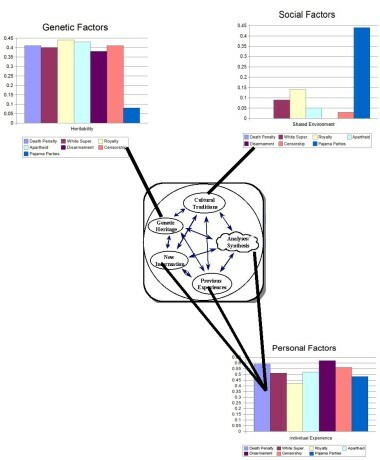 Likewise, a researcher working at the University of Nebraska – Lincoln discovered that the influence from socialization on many aspects of personality plummets during life (Alford and Hibbing 2004; Alford, Funk and Hibbing 2005). Under any of this “nature”-oriented research, “stability” is called into question if not attacked. “3 tips: Maximizing Card Rewards,” by Gerri Willis, CNN, 10 August 2006, http://money.cnn.com/2006/08/09/pf/saving/toptips/index.htm. “Credit card issuers slash rebates on use at pumps,” by Harriet Brackey, South Florida Sun-Sentinel, 25 August 2006, http://www.sun-sentinel.com/business/local/sfl-znoreward25aug25,0,5553635.story?coll=sfla-business-headlines. Credit cards may become a little less good for you. American Express, too, will end double cash-back points paid on “everyday” purchases to cardholders in its Membership Rewards program starting in October. An earlier version of this column incorrectly stated that 6 million credit card solicitations were sent out annually. In addition, it incorrectly indicated that American Express would eliminate double-reward points on all merchandise. CNNMoney.com regrets the errors. This isn’t exactly a big scandal — Citibank and MasterCard are not in a league of villains with NationMaster and Ask.com — but it’s still annoying. Getting 5% has been nifty, and it will be annoying trying to find an alternative card or, failing that, using anyone-but-CitiMasterCard out of spite. Is any 5%-on-food card company not betraying the hopes and dreams of American shoppers — and American democracy — by continuing such a rebate program? T&C also strongly support the information-processing model — a model already used by John Boyd’s OODA Loop. The other readings for this week were Alford’s and Hibbing’s The Origin of Politics: An Evolutionary Theory of Political Behavior (article, notes) and Steven Pinker’s The Blank Slate (amazon, notes). Some rules for evaluation hypotheses by the evolutionary criterion are as follows. 1. 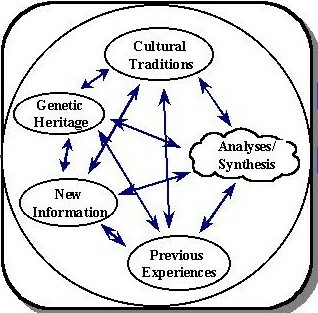 Obviously, at a minimum, a candidate architecture must be able to perform all of the tasks and subtasks necessary for it to reproduce… a hypothesis should not entail an architecture that is substantially inferior at promoting its own propagation (its inclusive fitness) replace an architecture that was better designed to promote fitness under ancestral conditions… A candidate architecture should not require the world to be other than it really is. For example, models of grammar acquisition that assume that adults standardly correct their children’s grammatical errors do not meet this condition… An architecture that was architecture that was completely open to manipulation by others, without any tendency whatsoever to modify or resist exploitative or damaging social input, would be strongly selected against… a candidate theory should not invoke hypotheses that require assumptions about the coordinated actions of others (or any part of the environment) unless it explains how such coordination reliably came about during the Pleistocene hunter-gatherer life…5. A candidate model must not propose the existence of complex capacities in the human psychological architecture unless these capacities solve or solved adaptive (design-propagative) problems for the individual. On October 27, 312, the world changed. What exactly happened is disputed. A “heavenly sign,” apparently some form of crossed disc, appeared to Gaius Constantinus outside of Rome. Constantinus read into it “By this, Conquer.” Within twelve hours the world had have turned. Christianity had a shield. More importantly, the Christians had an army. The Roman Legions were not the first military force fielded by the Jesusist-Paulists. The Armenian King Trdat III submitted his armies to Christ eleven years earlier, but if Christianity had stopped at Armenia the plans of Caiaphas and Diocletian (to force Christianity to morph into violent military force that could be processed as a regular insurgency) would have been victorious. When Tiridates III converted, Christianity gained a weak country. When Constantine I converted, Christianity gained the world. This exponential increase in the size of Christianity’s 4GW militia was not entirely surprising. In spite of being under a persecution that would last until 313, the Christians were using the using the power of women to subvert masculine lines of control and communication. While the fading crypto-Maoist ideals of Greece were passed along in masculine education, Christianity focused on the conversion of women and subsequent mother-to-child indoctrination. Constantine’s mother was a Christian. But as for those who say, There was when He was not, and Before being born He was not, and that He came into existence out of nothing or who assert that the Son of God is of a different hypostasis or substance, or is subject to alteration or change – those the Catholic and apostolic Church anathematizes. Moreover, in the case of the Christians especially we esteemed it best to order that if it happens anyone heretofore has bought from our treasury from anyone whatsoever, those places where they were previously accustomed to assemble, concerning which a certain decree had been made and a letter sent to you officially, the same shall be restored to the Christians without payment or any claim of recompense and without any kind of fraud or deception, Those, moreover, who have obtained the same by gift, are likewise to return them at once to the Christians. Besides, both those who have purchased and those who have secured them by gift, are to appeal to the vicar if they seek any recompense from our bounty, that they may be cared for through our clemency,. All this property ought to be delivered at once to the community of the Christians through your intercession, and without delay. And since these Christians are known to have possessed not only those places in which they were accustomed to assemble, but also other property, namely the churches, belonging to them as a corporation and not as individuals, all these things which we have included under the above law, you will order to be restored, without any hesitation or controversy at all, to these Christians, that is to say to the corporations and their conventicles: providing, of course, that the above arrangements be followed so that those who return the same without payment, as we have said, may hope for an indemnity from our bounty. In all these circumstances you ought to tender your most efficacious intervention to the community of the Christians, that our command may be carried into effect as quickly as possible, whereby, moreover, through our clemency, public order may be secured. Let this be done so that, as we have said above, Divine favor towards us, which, under the most important circumstances we have already experienced, may, for all time, preserve and prosper our successes together with the good of the state. Moreover, in order that the statement of this decree of our good will may come to the notice of all, this rescript, published by your decree, shall be announced everywhere and brought to the knowledge of all, so that the decree of this, our benevolence, cannot be concealed. Constantine decreased the physical connectivity of non-Christians. Money was diverted from pagan temple to the Christian Church, in nearly exactly the same way later Chinese Communists would divert wealth from churches to the Communist Party. Non-Christians could not own Christian slaves, a measure designed to prevent an anti-Christian reaction by the chattel-owning class. The old Maoism of Greek civilization would not lie dead dreaming for long. It spoke to men in strange dreams. It would teach the Romans new ways to shout and kill and revel and enjoy themselves. All the Christian world would flame. A New Rome would be born. I asked him if he worked with maps in geography. He did. So I suggested that he do his paper on maps and fantasy, and I brainstormed ideas with him. Maps, like fantasy, are neither objective nor value-free. They are someone’s vision of reality, a combination of the imagination and the intellect. I had read a fascinating book on maps by Peter Whitfield (1994). He argued that the act of representing reality in maps was not too different form the act of representing it in art or literature. It was the same impulse to crystallize, comprehend, and therefore to control aspects of reality. The rest are, of course, below the fold. Cooper-Clark, D.(1996). A story waiting to be told: Narratives of teaching, scholarship, and theory. In J.K. Roth (Ed.) Inspiring Teaching: Carnegie Professors of the Year Speak. Bolton, MA: Anker Publishing Company, Inc. (pp. 166-175). Halpern, D.F. (1994). Rethinking college instruction for a changing world. In D. Halpern (Ed.) Changing College Classrooms. San Francisco, CA. : Jossey-Bass. (pp. 1-10). “The Origin of Politics: An Evolutionary Theory of Political Behavior,” by John Alford and John Hibbing, Perspectives on Politics, Vol 2. No. 4, December 2004, 707-723, http://journals.cambridge.org/action/displayAbstract?fromPage=online&aid=266160. Today’s notes are from the John R. Alford and John R. Hibbing piece that preceded their piece “Are Political Orientations Genetically Transmitted?,” which was featured on the tdaxp post “The DNA of Politics.” In this earlier work they tie together wary cooperation and multilevel selection” to propose a new paradigm for political science. It’s so good, it’s dangerous. If there is an uplifting, ennobling finding here, it is the important of non-shared environmental factors, what Boyd would have termed new information, previous experiences, and analyses/synthesis. The rest of the notes are mad cool, dealing with group selection, problems a SysAdmin force may face, some cool simulations, and other amazing nifty things. They’re below the fold. “‘Machiavellian’ Intelligence as a Basis for the Evolution of Cooperative Dispositions,” by John Orbell, Tomonori Morikawa, Jason Hartwig, James Hanley, Nichlar Allen, American Political Science Review, Vol. 98 No. 1, February 2004, http://journals.cambridge.org/action/displayAbstract?fromPage=online&aid=205144. “Machiavellian Intelligence and the Evolution of Cooperation,” by John Orbell, Tomonori Morikawa, Jason Hartwig, James Hanley, Nichlar Allen, http://lynx.let.hokudai.ac.jp/COE21/presentation/1stcefom21/Orbell.ppt. “Empathetic Neural Responses are Modulated by the Perceived Fairness of Others,” by Tania Singer, Ben Seymour, John O’Doherty, Klaas Stephan, Raymond Dolan, and Chris Frith, Nature, Vol. 439 No. 26, January 2006, http://www.ncbi.nlm.nih.gov.ezp1.harvard.edu/entrez/query.fcgi?holding=hulib&cmd=Retrieve&db=pubmed&dopt=Abstract&list_uids=16421576&query_hl=2&itool=pubmed_docsum. Three journal articles today, all focusing on cooperation. 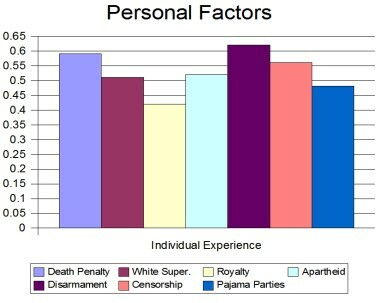 The most interesting is Orbell et al’s, where they ran a computer simulation with attributes of mind-reading and deceitfulness. 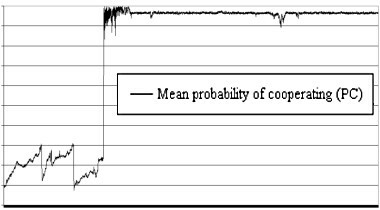 They found a sudden increase in social cooperation as a result of a small increase in mind-reading ability: talk about a group-selection rule-set reset! Further down, Singer et al demonstrates a mechanism to force honesty: empathy. The flip-side of everyday honest if justice, of course, and Singer finds that men enjoy justice more than women. In other words, men are competitive-cooperative. Last, Henrich et al attack the idea of profit-maximizing Economic Man and show that homo sapiens rationally relies on analogies, instead. The authors also have an interesting discussion of gift societies. The notes themselves are below the fold. “The perception-action model of empathy states that the observation or imagination of another person in a particular emotional state automatically activates a representation of that state in the observer.” (Singer et al 466).